Mary is the woman who does not see herself, unless it be in Christ and, through him, in humanity. By giv­ing birth to Jesus, who is the Son of God and the Son of Man, she gave birth to humanity. In the fiat of the Annunciation is the adherence of every one of us. That is why no being is as permeable to the love of Christ as is the Blessed Virgin. That is why, as Dante says, she is the daughter of her Son. 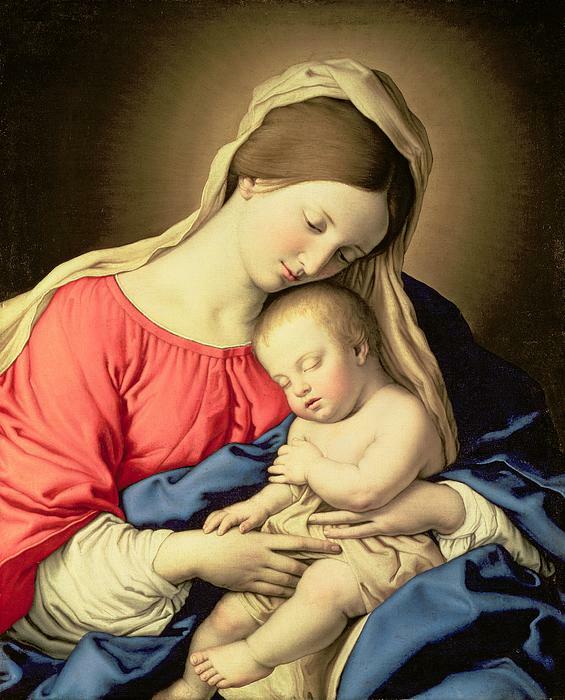 She is born of her Son, according to divine life, and that is why she was born of him as he could be of her. This is precisely the reason why the Most Blessed Virgin remains a way of light to Jesus for us. It is a fact that it is impossible not to love the Blessed Virgin when we love Christ. The Most Blessed Virgin is a kind of sacrament, the sacrament of God’s tender love for us, for God is as much a father as a mother; and, besides, she is espe­cially the Mother of Christ in us. For Mary’s motherhood is not a motherhood in time, it is a motherhood in eternity because she conceived in a total and absolute gift of herself, because she adopted us all in this acceptance of Jesus within her entire being. There is no end to her motherhood. She is the one who is the Mother of Christ in our lives; that is her role throughout eternity. Hence, it is absolutely natural for us to expose our­selves to the radiant influence of the Blessed Virgin in order to receive from her this Christ she is eternally responsible for bringing to life in us. This is a wonderful and infallible gesture. It is impossible to turn ourselves to the Blessed Virgin without reaching Christ through her for, since she has nothing, she can only lead us to him. To follow that road is to follow the very order of the Incarnation since it is through Mary that Jesus entered the world. It is always through Mary that Christ will enter into our souls; and the most amazing part of our trust in this inexhaustible motherhood of the Blessed Virgin is that we can at every moment avail ourselves of the love of the Blessed Virgin and offer it to Our Lord..